What is this incredible new guitar synthesizer that is suddenly finding its way into the hands of such superstars as Jeff Baxter, James Vincent, Steve Miller, and Jimmy Page of the famed Led Zeppelin? 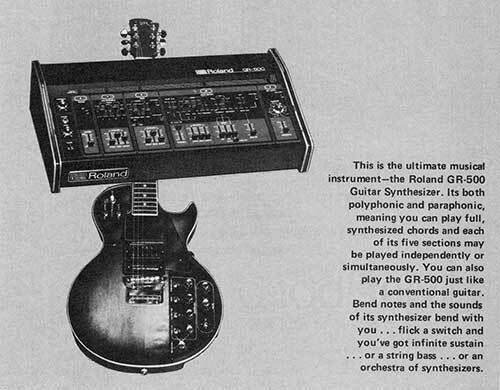 It is Roland's new GR-500 Guitar Synthesizer...both paraphonic and polyphonic. Polyphonic because full chords can be synthesized. Paraphonic because all five sections may played at once. An auxiliary, external synthesizer can be controlled by the Guitar. Chords may be sustained for any duration. You can bend synthesized tones throughout the scale. Any of the five sections can be channeled to three separate amps. The result of all this is that for the first time in history the guitarist commands even greater control of his music than the keyboardist! The Roland Guitar Synthesizer consists of two units. The guitar looks, feels, plays and functions much like any solid, high-quality guitar with two pickups (one humbucking). The guitar plugs into a synthesizer unit which can be placed on a stand or the top of an amp, near the guitarist. The connecting cable has 24 conductors, making it possible for the guitarist to control, from the guitar, many functions normally found on a synthesizer. The second pickup on the guitar is a special divided pickup. It is actually six small pickups—one for each string—each sending its own signal to the synthesizer section. This enables you to select different sounds for each string. Once the signals reach the synthesizer control unit, you can begin to synthesize sounds. Generally you work from left to right on the control panel when making adjustments. The first section you come to on the panel is the Guitar Section. This controls normal guitar sound through equalization. Because the control unit has three outputs it is possible to select which output any particular sound will be channeled to. Imagine you are using three Roland JC amplifiers . . . one on the left of the stage, one in the center, and one on the right. You would probably want the regular guitar sound to come from the center amp. You therefore set the channel selector of the Guitar Section to the output which feeds the center amp. Further adjustment of the sound can be made at the amp. The next section on the control unit is the Polyensemble Section. It provides sounds similar to woodwinds, brass, soft reeds, and such solo effects as a harpsichord or human voice. The Polyensemble Section operates much like a conventional, polyphonic synthesizer. All the guitar strings will cause synthesized sound to be produced. Plus, you can bend strings as much as you like and the synthesized sounds will follow beautifully. The Bass Section is next. Its controls, which include envelope adjustments, enable you to get sounds that closely resemble string bass, electric bass, strings or tuba. The Solo Melody Section gives you solo sounds that can be shaped with square and sawtooth waves, VCF's, VCA's and envelope controls, just like in conventional synthesizers. Here again synthesized sounds follow your note-bending techniques with no problem. The External Synthesizer Section lets you control other synthesizers. By connecting a larger synthesizer, you can create sounds that are truly incredible. Because Roland believes in compatibility between synthesizers, the possibilities are endless. You really have control of your sound when you play a GR-500. The control panel is simple to operate, and all of the sounds are available at the flick of a switch on the guitar. For example, imagine a four-piece group—three guitars and drums. At the beginning, the lead guitarist wants a really raunchy sound. He flicks a switch on the GR-500, activating the Guitar Section. An adjacent, rotary knob changes the tone. This control is far more powerful than any tone controls built into a guitar before. It controls an equalizer on the control unit. When the guitarist comes to a solo, he wants a heavier sound. He flicks on the Bass Section. In addition to his raunchy lead, he's delivering a thundering bass in unison. The bass player plays a counterpoint and it really sounds very heavy. The lead player is using three independent amps with the GR-500…the lead coming from center-stage. But when he activates the Bass Section, the bass sound comes from the far right…another instrument "seems to appear from nowhere." For the next part of the number, the thundering bass on the right disappears and a dreamlike chorus of sound from the Polyensemble Section comes from left-stage…blending beautifully with guitar sound from center-stage. All of these changes are made from the guitar. There is one very important feature of the GR-500 that deserves to be emphasized. The GR-500 gives you infinite sustain. Some people spend the price of a GR-500 just trying to get that single effect! At last…an instrument that requires no "inspiration from the gods." You are in complete control. You are the creator ... the GR-500 definitely will set your creativity free. There is no other instrument like it.